So, I’ve been trying out CoSchedule for a few weeks, and I have to say that I love it. It’s a great tool that has combined a few things for me. Because I’m a blogger and a virtual assistant, it lets me schedule posts for my own blogs and social media as well as others, without switching back and forth and logging into a million different things. I wish I had a dime for all the times I left one thing to log into another and totally lost track of what I was doing because the phone rang or someone knocked on the door or whatever the case may be. Now since I don’t have to leave the site, I can get right back to work after that phone call is over. It’s a major time saver for me. I was using a plugin for my editorial calendar, which CoSchedule has replaced. Secondly, I was also using another service for any scheduled social media, which CoSchedule is also taking care of for me now. 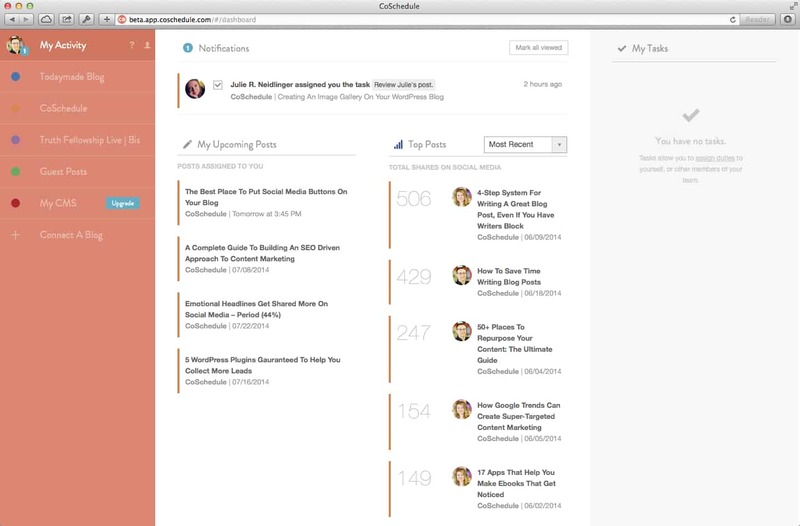 CoSchedule replaces two things – for the same price as one. I can also see it all in the same place now, which is cool. The program integrates with WordPress, Twitter, Facebook, LinkedIn, Buffer, and even Google+ Pages. No Pinterest at the moment, but there is no doubt in my mind that the great minds that developed the plugin will figure out how to get that back and running shortly. I get distracted easily. Switching back and forth from my blog to the other service to the other blog…it’s all very time consuming and confusing. And I’m always afraid that I will post the wrong thing on the wrong page. CoSchedule lets me color code stuff, so for example, everything related to this blog is purple. It makes it easy to see what is going on in each place. It’s drag and drop too…I love anything that’s drag and drop. All that copying and pasting nonsense leaves too much room for error in my opinion. One of the best things about CoSchedule is that as you drag a post from one date to another, your social media messages move with it. 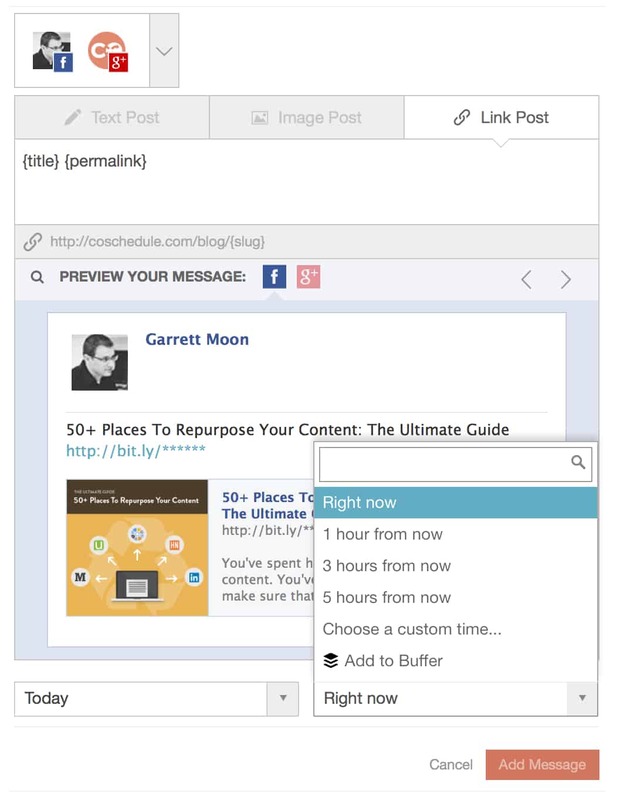 So you can create a series of messages that promote your blog posts on a rolling schedule. 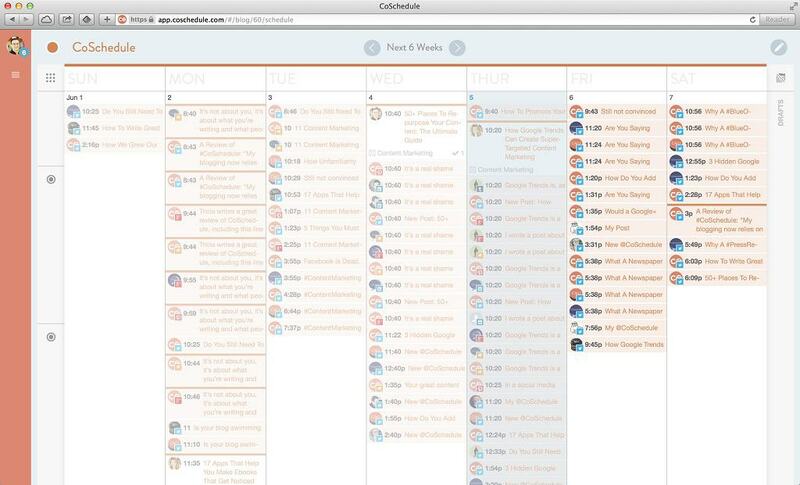 You can also use CoSchedule for as many blogs as you want, and they all appear on one account. Great feature for those of us with spoons in many different pots. And look how simple the dashboard design is! It’s also great if you have a VA working for you or if you are one for someone else – CoSchedule is set up for everyone to be able to go in there and list tasks for each other and update things. It keeps everything together all in the same place. If I had to give CoSchedule a rating based on one to five stars, I’d give it four – only because the monthly price of ten dollars is per blog, instead of per user. However, there are a few ways to get around that. One is by writing a review…as I am doing now…so you can cut your bill in half. Boom. Two blogs for the price of one. Secondly, they offer a referral program. For each person you refer that keeps an active account, they give you 10% off. So you could actually get it free if you got 10 people. This is my is my CoSchedule referral link…feel free to click it! You also get a free trial, and can extend the free trial by sharing with social media. Bonus: The people at CoSchedule will find it and share it so you get more traffic! 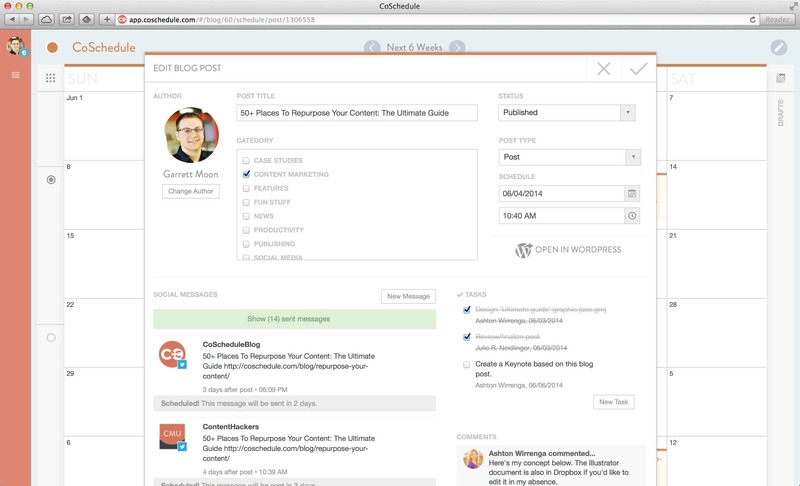 Watch this video to see how CoSchedule can make it easy for you to post, promote, and schedule! Love the review. My trial just ended with CoSchedule. Trying to decide if it is worth the money for a newbie blogger. Looks like is! I think it would be very helpful for a newbie blogger. Now it’s second nature, but CoSchedule is pretty simple to use and when I started blogging, the simpler things were what I was looking for! Plus, there are lots of ways to cut the cost (feel free to use my referral link!) Good luck with the new blog!